Most of the equipment that is needed for cricket players meets the standard of specific guidelines laid out as the “Laws of Cricket”. This is the authority on rules and regulations that need to be followed by all cricket personnel during a professional game. The following list will give a run down of the basic items and their specifications. The type of balls that are standard for use in cricket games are widely referred to as cork balls. You would want to avoid being hit by this at all costs. It is extremely hard and has a leather skin covering it’s surface. It will cause serious injury to anything it is moving fast in the direction of. You’re bound to hear a hard “smack!” upon impact because it weighs up to 162 grams. That is a staggering amount of weight for a ball its size. Unlike other balls that are used in other sports, the color used the most for a Test and First Class match, is red. The second most commonly used color, white, would only be used in a one day match. Bats are another very important item required for playing cricket. Cricket bats are made exclusively of flattened out wood. In my humble opinion they are more sensibly shaped when compared to bats in American sports. Its handle is conical in shape, much like baseball bats but there are very different measurements. The Laws of Cricket prohibit the use of any bat which exceeds 96 and a half centimeters in length. They also must be no more than 10 centimeters in width. Knowing that weight of the bat depends on what kinds of materials it is made out of, there is no standard weight. Still, they typically weigh no more than 1.5 kg. The required outerwear for a Cricket player during matches, usually consists of a standard quality polo shirt. Long polo sleeves are optional, their use is mainly influenced by weather conditions. Woolen vests and jumpers can be worn as a layer in considerably cold weather. Long white trousers have become a traditional accessory for most players. Although there are caps specifically made for cricket, baseball caps, visors, and sun hats are all appropriate headwear for players during the game. For footwear, spiked shoes are ideally worn. Traction is imperative to each player’s safety and performance. As with almost every other sport, the safety of the athletes who are on the field is a #1 priority. As a rule, cricket players must wear proper protective gear. Cricket is in many respects, a contact sport so precautions must be taken, especially in the event of some of cricket’s most dangerous situations. The last thing you want, is to get hit by any of the equipment mentioned earlier. The best way for players to protect themselves from injury is to wear an abdomen guard, also known as a box or a cup. This will help to absorb much of the effect caused by the ball’s impact if it should end up hitting an unsuspecting cricketer. There are also leg pads for players which will adequately serve as shin protectors. Leg pads are also available to fielders who are positioned near batsmen. Players in these positions are just as vulnerable to injuries. 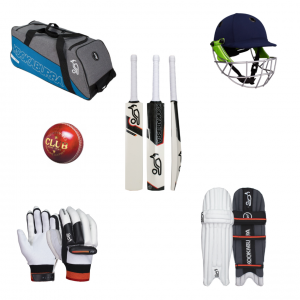 Well, that just about wraps up our list of required cricket equipment. Always remember, If you play cricket, to play it safe.